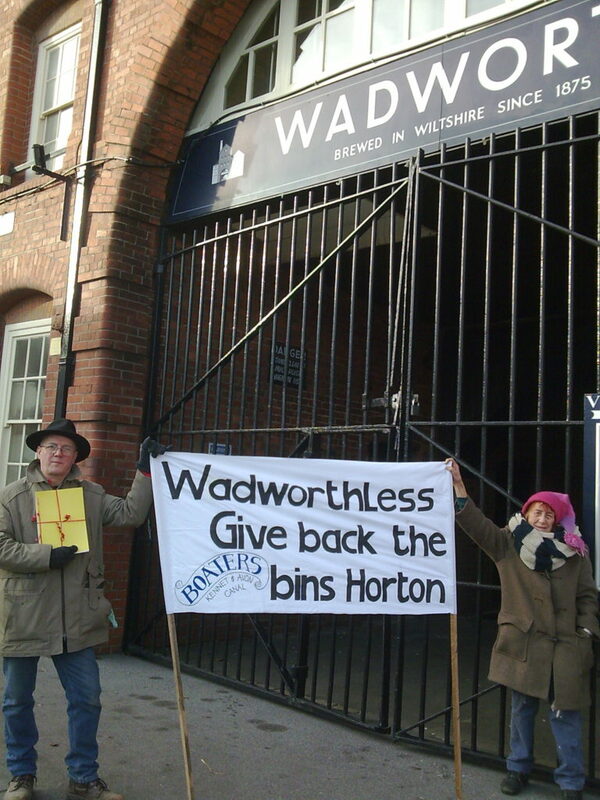 Following the announcement that boaters would hand in the 400-signature petition to Wadworths Brewery in a demonstration on 9th January, Wadworths contacted one of the boaters who earlier complained about the removal of the bins at the Bridge Inn, Horton. Wadworths have offered an alternative site for smaller bins, but putting this offer into practice relies on Canal & River Trust including the new site in its bin collection schedule. The petition was presented to Canal & River Trust in November 2018 but no response has been received from the Trust so far. Over 400 people signed the petition to Wadworths and Canal & River Trust to re-instate the boaters’ bins at the Bridge Inn. This entry was posted on Friday, February 1st, 2019 at 5:10 pm	and is filed under News. You can follow any responses to this entry through the RSS 2.0 feed. You can skip to the end and leave a response. Pinging is currently not allowed.